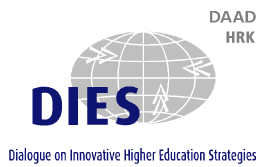 The German Academic Exchange Service (DAAD) – Section for Joint Higher Education Management Programmes (DIES) - and the University of Applied Sciences Osnabrück (OS UAS), the German Rectors’ Conference (HRK), the Centre for Higher Education Development (CHE) in cooperation with the Alexander-von-Humboldt Foundation (AvH) and partner universities in Southeast Asia are jointly organising the International Deans’ Course for Southeast Asia. This intensive training course is part of the DIES programme (Dialogue on Innovative Higher Education Strategies) which is jointly coordinated by DAAD and HRK and aims at supporting higher education management in developing contries. The key objective of the course is to bring together a group of about 30 newly elected or designated deans and vice-deans from universities of the Southeast Asian region and to assist in preparing them for the challenges of holding a dean’s position in a changing higher education landscape. Issues such as strategic faculty management, financial management, quality assurance and leadership will be key parts of this course. A soft skills workshop and an exchange with German university leaders about higher education reforms will be included as well.